From the heart of Indiana our skilled Amish woodworkers handcraft the Amish Empire Work Desk. 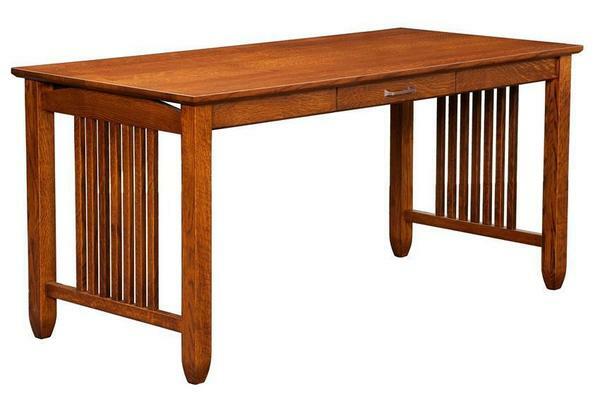 This mission style desk offers just the right amount of work space to serve you. Custom made for your home, we offer the Empire Work Desk in six different sizes. Select the dimensions that work best for you. The mission slats that define mission style furniture are displayed along the sides of this beautiful desk. A slender central drawer provides room for writing tools and some writing paper. Set up your laptop and create that quiet space in your bedroom, home office or family room to write and work on your computer. The Empire is shown here in quarter sawn white oak wood with golden brown stain. Quarter sawn white oak wood is warm and inviting, with natural flaking patterns featured throughout the wood. The oak log is cut in an intricate pattern to produce quarter sawn wood, making the wood resistant to cupping or warping, therefore, reinforcing its strength. This is a desk that will remain in your family for years. Enjoy the heirloom quality that Amish made furniture provides. Be sure to view our collection of Desk Chairs to select a comfortable seat for this mission desk. Please call us with any questions, toll-free at 866-272-6773. We are happy to assist you. Width: 48", 54", 60" , 66", 72", 84"
Floor to Bottom of Drawer: 26"